Hedgehogs are often described as “cute and cuddly” and “cactus mammals”. They are certainly not soft and fluffy like a puppy, kitty, or your favorite teddy bear. Can they snuggle into the crook of your arm and fall asleep? Absolutely! Can they fall asleep on your chest while you enjoy a movie reclining in your favorite chair? Certainly! Do they ever “melt” in the palm of your hand as you scratch their favorite spot? Definitely! Will you get pricked during the bonding process? Definitely, but it is worth the effort. Once they are bonded can you pet them without getting pricked? Without a doubt. In spite of how prickly a hedgehog might seem, nearly any hedgehog can be handled with bare hands. 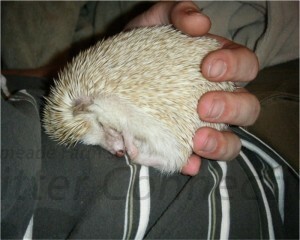 When a hedgehog is completely comfortable and relaxed, it can put its spines down, laying them completely flat. A relaxed hedgehog is very easy to handle and may let you pick it up, rub its belly, and scratch its back all without a single poke or prickle. When a hedgehog is NOT relaxed and comfortable, it becomes a prickly little cactus and certainly not cuddly by any stretch of definition. Just to confuse matters a little more, some hedgehogs that are relaxed simply do not like to cuddle as much as others and some will not cuddle at all. Some hedgehogs are more active than others, and often prefer to explore their environment more than cuddle or sleep on their owners’ lap. This preference is largely related to the individual temperament and personality of a hedgehog, and is difficult to predict. However, even if a hedgehog isn’t interested in cuddling at first, a little patience, understanding, and trust building may lead it to sleep on your lap or even burrow around in your hoodie for little snuggle time. Many hedgehogs enjoy a good movie. Seriously! As mentioned above (in the introduction), if you sit back in your favorite chair and allow your hedgehog to snuggle into you, what could be more comfortable than a warm, human pillow? The big “BUT” is that your hedgehog needs to trust you. It must feel comfortable enough with you to relax. 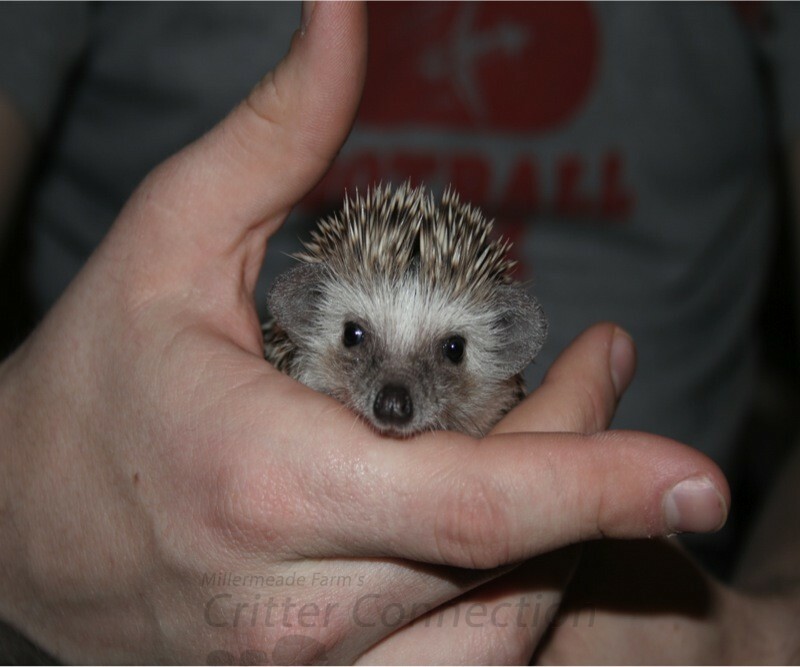 A good breeder will demonstrate ways for you to hold your hedgehog comfortably and give you tips as you begin your adventure with your new pet. It’s important to handle your hedgehog with your bare hands and to allow it to explore outside the cage. A hedgehog needs time to learn your smell and become comfortable with its surroundings. Building hedgehog trust does not always happen overnight, but with patience, persistence, and an understanding of hedgehogs you certainly can earn your hedgehog’s trust. 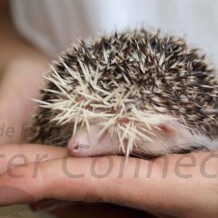 Cuddle time may be a little prickly in the beginning, but there are a few things that can make cuddling more comfortable for you and your hedgehog. Some hedgehogs will naturally burrow into your armpit (a favorite spot), a hoodie pocket, under your shirt, or up your sleeve. Other hedgehogs may need a small blanket or a towel to encourage cuddling. Make sure that the towel or blanket does not snag your hedgehog’s toenails. Using the same towel or blanket every time you cuddle your hedgehog will help familiarize your hedgehog with the bonding process. Be sure to familiarize your hedgehog with voices and movement. 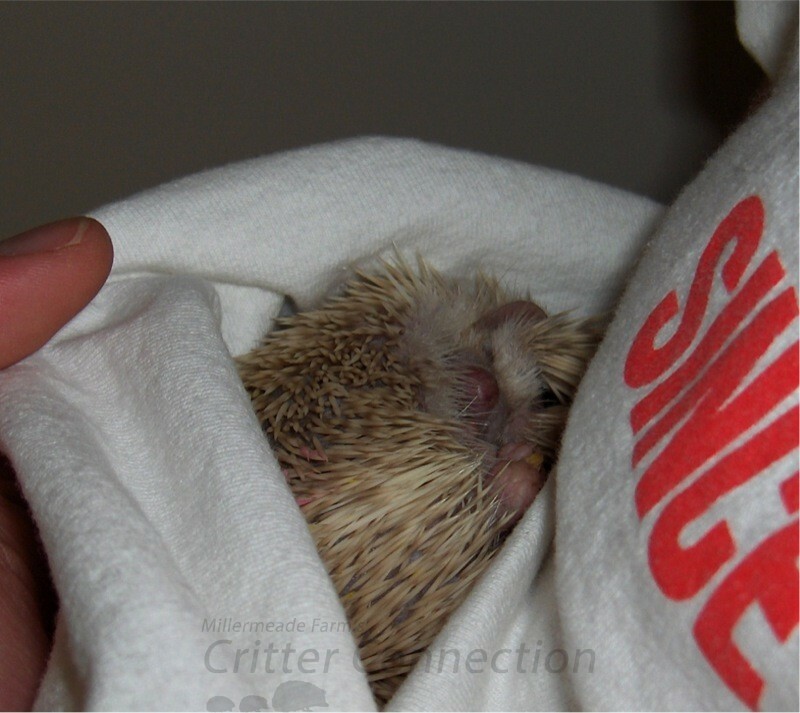 Carrying your hedgehog in a hoodie pocket or a pocket created by tucking in two layers of shirts and placing your hedgehog in between the layers will get your hedgehog used to you not being perfectly still. There are some hedgehogs that would rather explore and investigate than take a nap. They may view you as a mountain to conquer, and a nap and a cuddle is only necessary after an invigorating work out. An active hedgehog that is not cuddly in the beginning may cuddle after its curiosity has been fulfilled. It might even find a comfortable place where it can be close to you! A hoodie pocket or a sleeping bag may encourage an active hedgehog to take a nap according to your schedule, by providing a safe place to burrow and feel safe from an unfamiliar environment. Some hedgehogs may respond to bonding by becoming familiar with you and may prefer time exploring you before they are ready to be still. How Can I build my hedgehog’s trust? 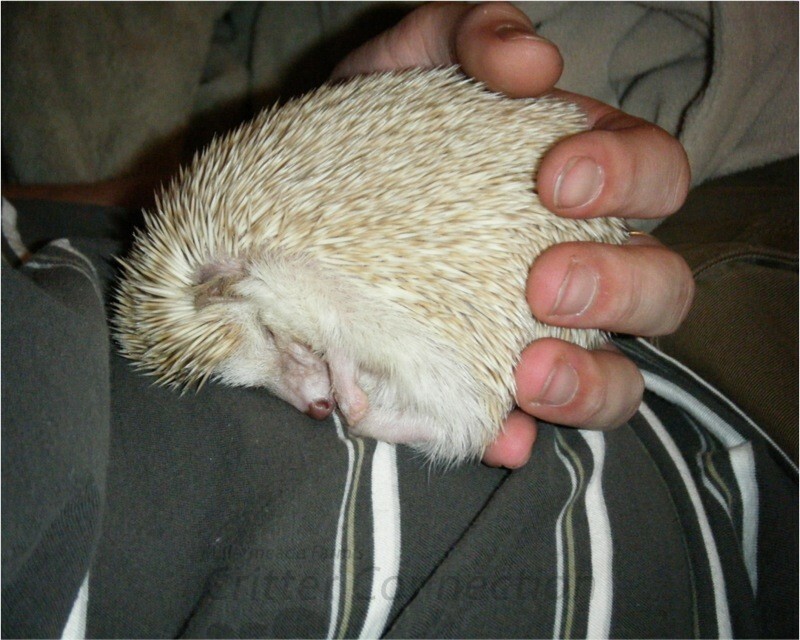 Handle your hedgehog often with your bare hands outside of its cage. The hedgehog needs to learn your smell and become completely comfortable with its surroundings. The best way to do this is to spend lots and lots of time holding them and being gentle to build their trust. It can take time to foster trust with your hedgehog, but with time, patience, persistence, and understanding, you can to earn the trust of your spikey friend. Allowing your hedgehog to explore in a safe area with toys and favorite treats will help your hedgehog become accustomed to being outside of its cage. Keep in mind that each hedgehog has their own personality and my respond differently to different types of time outside their cage. Also, remember that your hedgehog needs to adjust to its new surroundings with different smells, noises, and cage setup. Providing different places for your hedgehog to cuddle may help your hedgehog to find their best comfort zone.